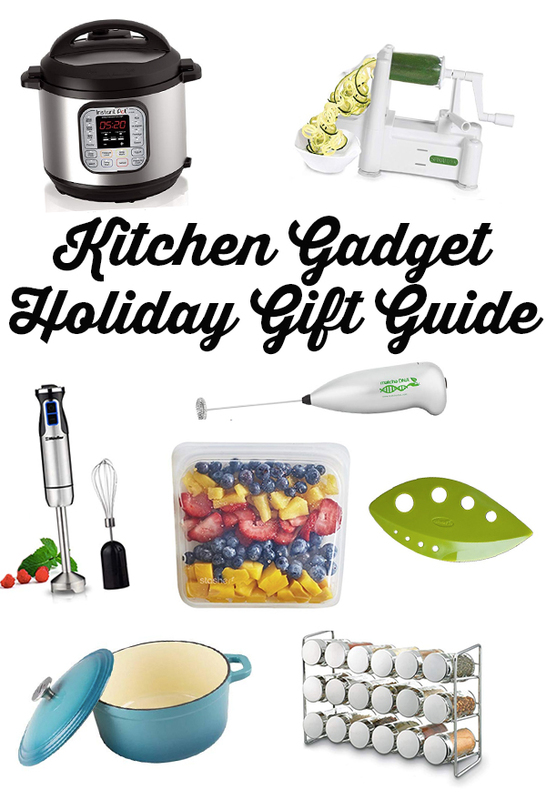 This kitchen must-haves holiday gift guide is full of gift ideas that are perfect for the home cook, food lover, or someone starting a new health journey! Have a foodie in your family? What about an avid home cook? Or someone who is embarking on a new health journey and is looking to get into more home cooking? Or what if you just want some new kitchen gadgets, appliances, and toys for yourself? I get ya. Guys… if you don’t have an Instant pot already, now is the time. The instant pot does everything. 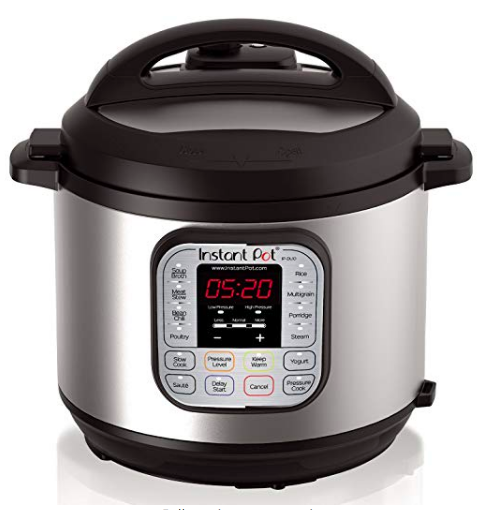 It has a slow cooker function, it makes hard-boiled eggs, it makes soups crazy fast, and just about everything else. Plastic baggies may be convenient, but they’re really not healthy or environmentally friendly. The last thing that we need is more plastic leeching into our food, or being thrown out. Stasher bags are silicone baggies that are the perfect substitute for plastic baggies! 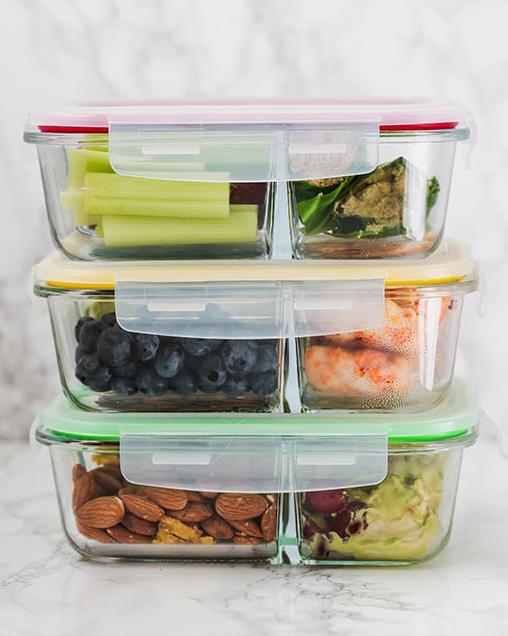 They come in different colors and sizes, and they’re perfect for storing snacks and storing food in the freezer! 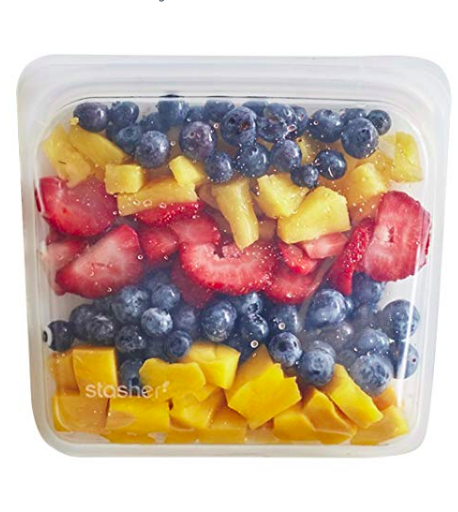 I used this divided Tupperware in my back to school lunch post and I got so many questions about where I got it from! They really make packing lunches easy. I love cooking with cast iron. I use enamel cast iron pans for photography as well as some cooking for my blog, and regular cast iron for cooking as well. Cast iron is much safer than non-stick pans and can add iron to your diet! Though you won’t get as much iron from coated cast iron as you would from non-coated, enamel cast iron is a bit easier to maintain and it’s much prettier! This is my favorite cast iron skillet (pictured here) and my favorite cast iron pot. 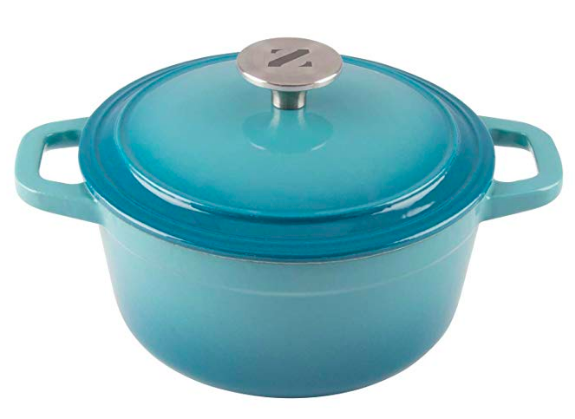 If you’d prefer a non-enamel cast iron, this is a great pan as well. I love adding fresh herbs to meals! They add tons of flavor and added nutrients. Some purists will say that these aren’t efficient for cutting herbs, but honestly… I hate cutting herbs with a knife. 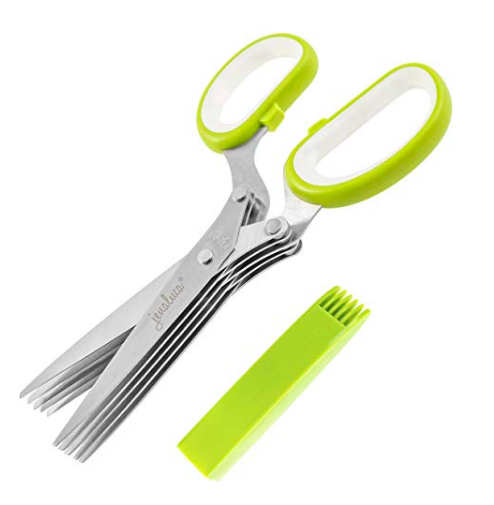 These herb scissors really speed up the process. After you cut up all those herbs, ya gotta find a good way to store them! 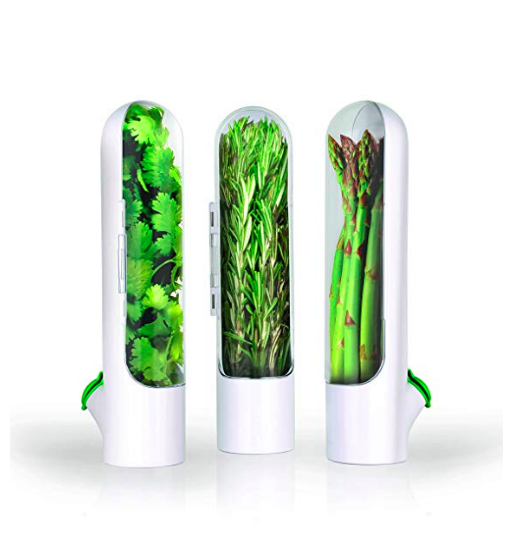 Herbs are hard to keep fresh, so this herb saver really helps. I have it on my list this year! 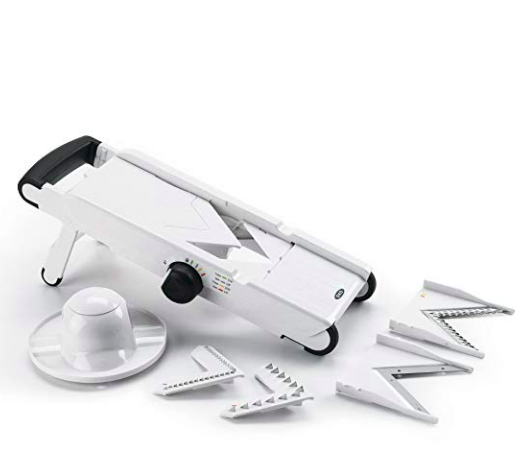 I used to think that mandoline slicers were excessive… why can’t you just use a knife? But seriously, I love my OXO mandoline slicer! It’s perfect for getting thin, uniform slices for hard to slice foods like plantains and turning them into perfect plantain chips. I also use it for sweet potatoes, zucchini for chips, and even onions. The nerdiest thing on this list, I know… but I actually have this on my Christmas list. No joke! I’m a big time onion cryer. Like… excessively. Both myself and Stinky (if you’re new here, that’s my cat) hate the smell of onions, and we both get teary-eyed from it. We’re basically ET and Elliot. I wish these onion goggles came in cat size too. 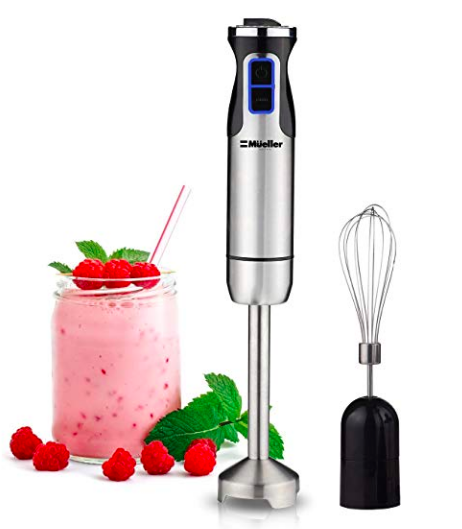 I got an immersion blender when Daniel and I got married, and I’m still obsessed with it. 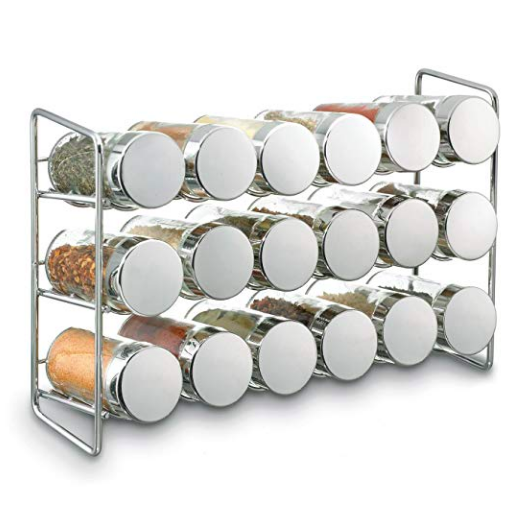 It’s perfect for making soups and sauces and it takes up very little room. Wondering if a spiralizer is worth the money? IT IS. I use a spiralizer to make veggie noodles, and it’s so much cheaper than buying them premade! My husband got this spice rack with this label set for us earlier this year, and I love it! The label set makes it so easy to find what I’m looking for, and it has so many options. My husband mounted ours to the wall, but it’s great for just setting on your countertop as well. 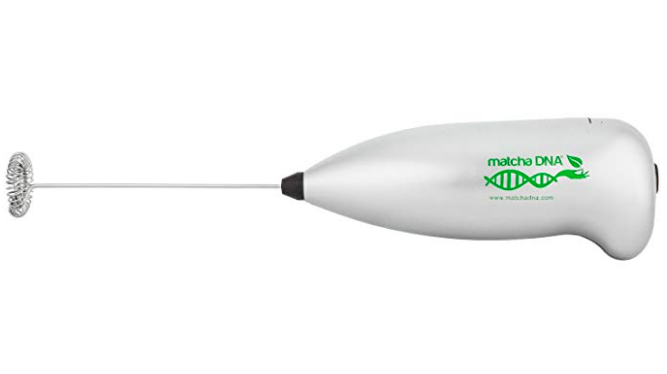 This handheld milk frother is something I use several times a week. Yes, it’s great if you’re making tea lattes but what I really use it for is making gelatin eggs! Seriously, you will never have trouble with gelatin eggs ever again after you get one of these. I love fresh garlic, but I do not love cutting it… at all. 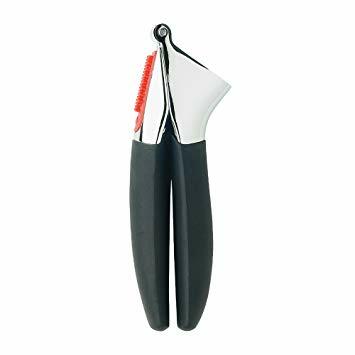 A garlic press is on my holiday wishlist this year for sure! I hope this list helped to give you some ideas! What are some of your favorite kitchen gadgets? As the year comes to a close, I am blown away by all that’s happened in just a years time. It’s been a crazy, long, hard, and over all exciting year. It was a huge year for Unbound Wellness which is honestly still in it’s baby stages as a business, and I’m excited to share those developments with you! But before I get into all of that, I wanted to let you know that a lot of this couldn’t be possible without you and your support. Thank you for reading my blog, trying my recipes, following along on Instagram, listening to the podcast, and more. I’m so grateful for your friendship and support! Yep. Seven hundred and twenty four percent increase from 2016 to 2017. Holy moly. My main goal for Unbound Wellness in 2017 was to just grow. More eyes, more lovely readers enjoying my recipes, and more interaction and engagement. I wanted to spread my message further, and zeroed in on putting tons of effort into growing. I shared 69 recipes new recipes! If you’re wondering how I increased my traffic in 2017, this is one of the top 3 answers for sure. I put a ton of time, effort, and research into stepping up my recipe development game this year, and I’ve been beyond thrilled to see how much it’s paid off! Recipe development, food photography, and sharing my recipes online brings me such an immense amount of joy! January 1st, 2017 was when the 30 Day Gut Healing Diet Plan & Guide hit the world wide web! As someone who has gone through their fairshare of gut issues, I created the guide because it was something that I wish would have existed when I started this journey. This e-book has 30 days of gut healing meals with photos of each day to make it super easy to follow, exclusive recipes, and more. You will definitely be seeing more things like this from me in the future! Coming from a background of working professionally in social media, I know that numbers don’t always mean much. Buying followers and spending all of your time on social media can be pretty pointless. However, getting to 10k followers on Instagram actually unlocks some extra features, and I’ve really loved growing my community! I was around 1k followers in January of 2017, and I’m at 10.7k in December. You can follow me here. This was a huge check off my bucket list! Speaking is one of my biggest passions, and the opportunity to talk business at Paleo f(X) was incredible!! I talked about growing your email list, which is something that I plan to focus on a lot more myself in 2018. Having my own podcast has been a dream of mine for years. When I met Anne Marie Garland of Grassfed Salsa, I felt like that could become a reality! Anne has dealt with autoimmune issues herself and is a nutritionist that is AIP minded. Anne I are so aligned on so many things, and she really fills in on the gaps that I lack! She’s become such a dear friend that I respect so much, and I appreciate the heck out of her. We started the Unbound Healing Podcast for others who are dealing with autoimmune and chronic illness issues, and we share how to manage those issues with diet, lifestyle, and more. You can subscribe on both iTunes and stitcher!! I like nuggets, okay?! And apparently you guys do too!! These Veggie Nuggets are one of my all time favorites! A real talk blog post of how I got my Hashimoto’s under control with diet, lifestyle, gut health, and more. I left my full-time job. This was huge. I was able to leave my full-time job to pursue other opportunities like freelancing, and working on my business last January. It hasn’t been easy, but it’s been beyond worth it! You can read more about my transition here. This year was all about focusing on Mercury detoxification after I learned that I was super toxic later in 2016. I wound up bringing down my levels significantly, and making some other strides. You can read all about that, and how I did it, here. Though Daniel and I really didn’t take any big vacations, we did a lot of smaller trips, work trips, and weekend trips. In 2017 I got to go to Austin 3 times total… 2 for work and 1 for fun (read one of my recaps here), Vegas for work, Key West and Orlando as a piggy back on Daniels work trip, Port Aransas as a family trip, DC as a friend reunion, and New York as another family trip and reunion (recap here). Working for myself has definetly allowed me to be a lot more flexible to work from wherever, and travel more! My husband and I found a new home church. Daniel and I have been looking for a church where we both feel at home since we’ve been married! We were always driving way too far to churches we used to go to in the past, and could never really find one near us that we felt at home at. When we bought out house in 2016, we jumped around for months before we decided to try a church close to our house in about the late winter of 2017. It’s a church that we both love and really feel at home at, and I’m so grateful to feel more grounded with it!! I started getting into vintage when I was a kid. I always loved old music and that slowly started to transition into fashion when I got into my teens. 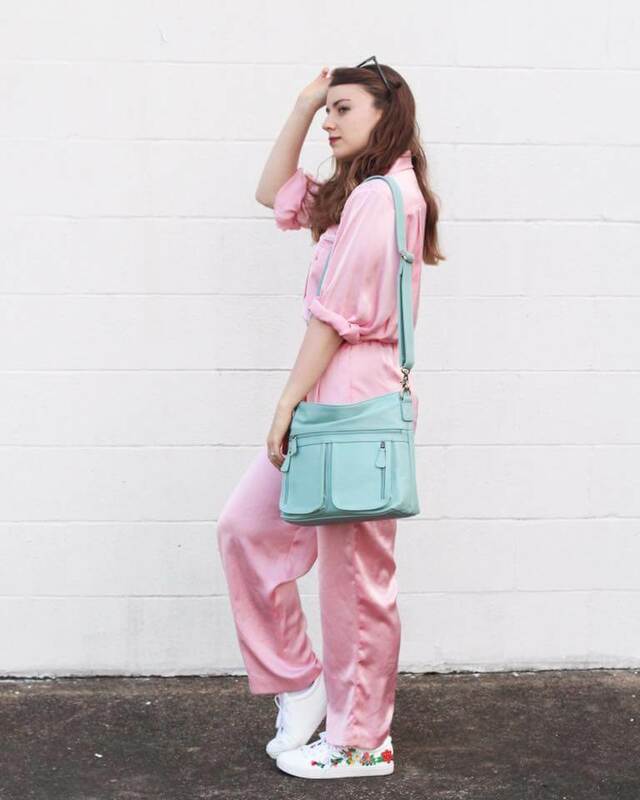 I would always frequent thrift stores and search online for fun vintage inspired looks, but honestly, it’s hard to really develop a strong personal style when you’re a teen! Photography by Karla Janneth, and dress from Vintage Tex. 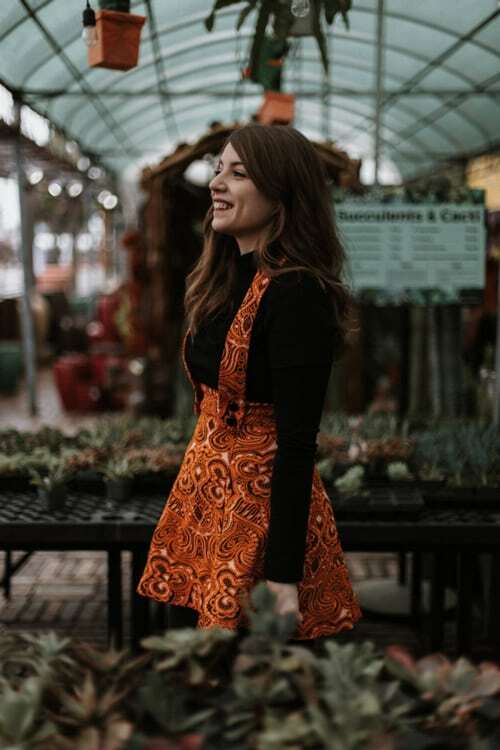 This 1960’s jumper dress… it’s all one piece! Photography by Karla Janneth, and dress from Ally Hoot Vintage. This 80’s barbie dream jumper. Photo by my husband, jumper from The Kissing Tree. If you couldn’t tell from all of the recipes I put out there this year, I’m really into recipe development. I’m constantly researching online and in books, and am brainstorming new ideas and flavor combinations. It’s the perfect mix of all of the creative things that I love like cooking, photography, editing, food styling, and the creative thinking needed for actually coming up with grain free, dairy free, egg free, nightshade free recipes that taste good! Working for yourself gets lonely. Even though I’m fairly introverted, I miss being around people. One of the ways I get past this is listening to podcasts. But honestly, listening to just health podcasts wears me out. I feel like I’m constantly in work mode and just can’t shut my brain off. I needed more entertaining podcasts and a fun community to get into. I found My Favorite Murder around the spring of 2017. As a person who is has always been into true crime, I thought it sounded interesting. MFM is a huge podcast with a flourishing fan base, and I was immediately hooked. It’s a true crime/comedy podcast (…but not together… you have to listen to really get it) and the hosts are so relatable and fun, it feels like they’re my new coworkers! I even dragged Daniel to their live show in Dallas, and would honestly do it again. Give it a listen… at your own risk if you scare easily! Daniel and I will be married for 4 year this January, and we’re moving closer and closer towards adding to our family. We know that there’s no way to ever be truly ready, but we want to be as prepared as we can. There are a lot of conversations to be had and decisions to be made for us as a couple, and we’re excited to start having them this year! Trust me, I am not slowing down with pumping out recipes! I’m currently planned out through March of 2018 as we speak. More on gut health, more podcasts, more vintage, and hopefully more on faith too! I’ll be sharing more content on all of the things I’ve already been sharing, and will hopefully adding more into the mix on things like vintage, and faith. Don’t worry… you’re not going to miss this one! Thank you all again for all of your support, love, and friendship over the last year. It’s been an absolute dream to do what I love and share it with you. Happy New Year, and I’ll see you lots more in 2018!! This June marks the one year anniversary of me becoming a nutritional therapy practitioner! It’s a title that’s enabled me to help hundreds of thousands of people through my blog, work one on one with dozens of women and see real change in their life, and leave my full time corporate job to pursue my own business. Though I received a bachelors degree in college in Emerging Media and Communication that helped me immensely, nothing has propelled me forward quite as quickly as the final push of becoming a nutritional therapy practitioner. It’s an amazing program, and I am so grateful to have gone through it and share with you how to become an NTP! So, how did I become a nutritional therapy practitioner? What does an NTP do? What jobs can you pursue with your certification? First, What Is An NTP? What Do They Do? A nutritional therapy practitioner (NTP) is certified by the nutritional therapy association to help people support their health holistically with individualized nutrition, and support of foundational health. We’re trained to address and assess issues like blood sugar regulation, digestive balancing, optimizing adrenal function, helping clients customize a nutrient dense diet that nourishes them, and more. We work with people in either a one on one setting or a group setting to help them holistically manage these struggles with real food, and foundational support. A nutritional therapy practitioner is not a board certified nutritionist. We cannot diagnosed or treat disease nor can we give medical advice, but what we can do is offer support that enhances the bodies natural ability to heal! From the second that I was diagnosed with Hashimoto’s disease I knew I wanted to help people who were in the same boat. I felt pulled towards nutrition, and spent my first two years of college studying to be an RD. I quickly learned that none of it was about real food, and I felt suffocated by the clinical information. I changed my focus to the digital marketing realm with dreams of always revisiting nutrition again later. About two years ago, I woke up one morning and was literally overwhelmed by the feeling that I wasn’t living my purpose. I had an incredibly rewarding job working in digital marketing in ministry, but I felt pulled into another direction… back to nutrition. I was just starting my own legitimate paleo/ AIP journey and began to immerse myself in the work of nutritionists that I admired. I studied what schools they went to and what programs they did for months. Seriously, I was constantly on my phone or computer watching video reviews, reading linkedin profiles, listening to podcasts, and more to find the best program. It’s a mostly remote program done online. There are 3 in-person workshops to add an element of community and hands on learning without being too overwhelming. They have amazing instructors and tons of support throughout the program. Their views align with a Weston A. Price/ paleo-ish template which I agree with. The content is way more about supporting foundational health (digestion, blood sugar, etc.) rather than just diets. You learn how the body actually works. First, what’s the difference between the NTP and NTC program? The NTA offers programs for both nutritional therapy practitioners and consultants. It’s basically all of the same content, but NTP’s learn the functional evaluation (more on that below) and have 3 workshop weekends, where as NTC’s only have one workshop and don’t learn the FE. Though I don’t really use the FE much as my practice is online, I opted for the NTP program because I really wanted to community support of extra workshop time! What do you actually learn? The content focuses on foundational health and explains how the body is supposed to work in an optimal state, how it can often go awry, and how to rebalance it. The content also takes you through nutrient dense eating and why it actually works! You’ll learn all about why healthy fats aren’t actually bad for you, why traditional foods like raw milk are the bomb, and how to properly prepare foods for optimal nutrition. Most importantly, you’ll learn how to translate all of the information that you learn to a client! You learn how to read food journals and make recommendations, how to assess symptoms, and recommend supplements to help your clients be successful! How is the content presented? The program is about 9 months and is mostly remote. That means that the content is video based with complimentary slides, reading assignments, audio lessons, bi-weekly group calls, and quizzes and homework that are due throughout each module. What is the functional evaluation? The functional evaluation is a hands on assessment that focuses on palpating certain points in the body to indicate stress. For example, you learn how to palpate that gallbladder to indicate stress on that organ and compromised fat digestion. Though it’s a helpful tool, I don’t use it in my practice as I work remotely. You’ll also learn lingual nuerotesting that involves testing supplements for potential success by using the functional evaluation, which is a great tool to have! What are the workshop weekends like? The workshops are all about practicing the functional evaluation, and getting more support on the content. The last two weekends also include the midterm and the final (which aren’t disgusting hard and you can easily pass if you study). It’s also an amazing opportunity to network and build friendships with other students! Where are the workshops? They hold workshops throughout the country and in Australia. I did my workshop in Austin, TX and they announce venues twice a year when they open enrollment. How much of a time commitment is it a week? For me, I spent between 10-15 hours a week or so on the content, and up to 20 hours a week but it fluctuates. There are breaks built in, like winter and spring break, and lots of opportunities to pace yourself. What Kind Of Job Opportunities Are There for Nutritional Therapy Practitioners? There are tons of opportunities that exist, but most importantly, your NTP certification is what you make of it. You can easily define what you want to do, and go out there and get after it. Nobody is going to spoon-feed you opportunities and being a successful NTP takes as much work as any other career. What Do I Do As A Nutritional Therapy Practitioner? So, how did I make it work? How did I quit my full-time corporate job? Here’s the thing… I’m currently not a full-time NTP. I use my marketing background to keep that side of my life thriving and work part time in the marketing world while I continue to grow my business. Businesses do not explode over night and it takes time to make it a full-time gig if you’re working for yourself! But it’s been the most rewarding, and most fun thing I’ve ever done and I wouldn’t change my job for the world! Start now. Don’t wait until you graduate to start writing that blog, recording that podcast or helping people. I started my blog a year before I graduated and it enabled me to have clients ready to go once I was ready for them, and build my email list to 1k people at that point. Pace yourself. You don’t have to do it all at once. There is plenty of time to get the work done, and to achieve your dreams. Don’t compare yourself to anyone. Building your dreams takes time! Don’t compare yourself to someone 4 years down the road when you’re only 4 months in. Embrace your tribe! The NTA is full of beautiful, supportive, likeminded people whom I absolutely love. Embrace your time with them, and build relationships! You have to be a self starter. The program will provide you with content you need to help clients but when it comes to getting the job and starting the business, only you have what it takes to make it happen. Check out classes the that are enrolling now! To become a nutritional therapy practitioner yourself and start making real changes in the world one person at a time, be sure to check out the classes that are enrolling now, here! I can’t wait for you to join our tribe of movers and shakers! One of the most common questions I get from clients, friends, and just readers of my blog is “how do you eat paleo/ AIP on the go?”. It is hard isn’t it? Especially with navigating cross contamination, weird oils, spices, and just the overall stress of it. I’ve blogged a few times now about my paleo/AIP travel adventures to Italy, Disney World, San Francisco, and I’ve shared a bit about my biggest trip to Indonesia… that was a tough one. This past weekend was one of my most enjoyable trips with the most paleo & AIP food success yet… Austin, TX! My husband and I live in Dallas, TX so Austin is just a few hours south. With my big transition in my business and job, we didn’t want to do anything too big and time consuming for our second anniversary this year, so Austin was an obvious choice. I did all of my nutritional therapy training in Austin last year and was so consumed with class that I barely had any time at all to enjoy all of the amazing paleo/ AIP food that Austin has to offer, so we were long over due for a visit! When I travel, I’m usually bringing a cooler, ice packs, and full prepared meals. However, since I knew that Austin would be so easy for eating I went pretty light on food to bring and road snacks. I brought along some epic bars, sea snax, sardines, carrots and fresh fruit! Our first stop on our trip from Austin to Dallas was the incredibly popular (and super busy) Magnolia Market in Waco, TX. Waco is always a popular stop between Austin and Dallas as it’s a larger town with plenty of gas stations to stop at on the long drive. There was never really any big tourist attraction for us in Waco (not football fans, sorry 😛 ) until Magnolia came around. It’s Chip and Joanna’s store from the show Fixer Upper, and it was too cute. Magnolia is a home decor store with a cool industrial area outback that’s filled with swings, food trucks, and areas to eat and to throw around some footballs. My husband went right for the cheesiest gluteniest thing he could find, and I gravitated towards Luna Juice Bar. I wasn’t feeling a juice, so I got a cold brew coffee with almond milk. I’m pretty sensitive to caffeine and didn’t get too far into this before I was feeling it and had to pass it off to my husband… still delicious though! Picnik is famous in the paleo world as one of the premiere paleo restaurants, and it felt like a pilgrimage coming here. Not only is it paleo, but they have an AIP menu! Everything is cooked in avocado oil, it’s all high quality protein, and the veggies are local. Swoon. My husband and I went twice… once for dinner, and for breakfast the next day. We gobbled up dinner so fast and the lighting wasn’t really working for me, so I missed pictures of those, but our breakfast was the bomb. I ordered a custom taco off their AIP menu with a Siete cassava tortilla (not actually strict AIP as it has thickeners, but fine for me in moderation), bacon, apple, their incredible AIP guac, and a non AIP peppermint mocha. The mocha had decaf coffee, cocoa butter, cocoa powder, coconut milk, MCT, and peppermint essential oil. I’m still dreaming about it! If you’re planning on visiting Austin, make Picnik the first thing on your list! I guarantee you’ll love it! We eventually ended up at Koriente. It was a crowd favorite during my NTA classes, but I was always afraid to indulge. This time I went for it and got a super custom bowl. I requested something super safe for me and they delivered! I got smoked salmon, avocado, carrot, and rice. I asked to hold the sesame, and sauces, and I wound up with a meal with just one AIP reintro (the rice) and a really satisfying little meal! This gelato shop was also high on my Austin bucket list as they seem to always have a vegan/dairy free option. This time, it was a mango sorbet! Though I would’ve preferred to have something coconut milk based, this sorbet hit the spot on an unseasonably warm day in Austin. Needless to say, Austin kills it with Paleo/ AIP friendly eats. I can’t wait to be back soon for Paleo FX in May!! What are you favorite Paleo eats in Austin? This title alone scares the crap out of me… but I did it. I grew up in the exact same world everybody else did. The one that taught us how to aspire to grow up to be a fireman, or a doctor, or a business man since kindergarten. The one that forced college applications down our throats since 9th grade. The one that assured us that we weren’t succeeding in life unless we pursued a 9-5. I went to college, I got an internship, and I got a job that I loved and held so much of my identity in. But still, I felt the pull to do something else. And I did. Last week, I left my full-time job to further grow my nutrition business and health blog… Unbound Wellness. My senior year of high school was both similar yet different to many. It was similar in the sense that I too was buried under college applications, SAT prep, and decision that I was entirely too immature to make. However, it took a very different turn when I started presenting Hashimoto’s symptoms and went undiagnosed for most of the school year. I was too sick to go to school without fainting for the majority of the time, so I spent a lot of time in my bed online pursuing Forever 21, Etsy, and Facebook. By total happenstance, I stumbled upon a health blog… my very first health blog… my life changed and it all started right there. That’s what I wanted to do. Write, create, and help people online, all for the sake of health. I wanted to help people out of what I was currently suffering through in a creative, fun way. At 17, sick in my bed with an autoimmune flare, I knew. After my Hashimoto’s diagnosis I became obsessed with nutrition and enrolled in Texas Women’s University to study dietetics to become an RD. Little did I know that it would stifle the heck out of my creativity and leave me feeling abundantly lost. Maybe it was the digital communication part of this whole world that fascinated me? I finished my degree studying Emerging Media and Communication and launched my career in digital marketing at an internet ministry. It was challenging, fun, and rewarding. I loved it and knew I was meant to help people online. Still.. I felt a pull to do nutrition again. I soon after went back to school at the Nutritional Therapy Association and began building Unbound Wellness… my own manifestation of what I always felt called to do. Little by little, day by day, my business and blog went from my tens, to hundreds, to thousands, to tens of thousands and more. I started working with clients in my own practice, I wrote an e-book, and I finally made the leap to pursue it as a career. It took years, but I finally took the leap to pursue Unbound Wellness away from a full-time job. Like I said… I loved my full-time job. I love internet ministry and really believe in what I was doing. I thought I was going to throw up when I walked out on my last day and it took me months to make the decision to leave. I cried, I felt guilty, and it was really, really hard. I felt blessed beyond belief to have something in my life so great that it made it so hard to walk away. Walking away from a societal norm is hard. I was made to believe that breaking up with that way of life would be liberating, glamorous, and reality simple, but it wasn’t. Everything always looks a million times easier than it actually is. Though I felt pulled to do this other thing entirely, it didn’t make walking aways from my norm any easier. I’ve been an internet side hustler since I was 16. I’ve figured out the ways to monetize, and I’ve been fairly good at it. Side hustling to make a little extra income on the side while having fun is relatively easy… making a full-time income is not easy. Though I’ve gotten to a point where I’m hitting a stride with Unbound Wellness, you’re also not going to see me on any top internet entrepreneur lists in the next few weeks. When building a business, you come to a point with a business when you’re a huge percentage of the way there, and yo think… “If I just had more time…”. I was working a 40 hour a week job, and coming home every day and every weekend to work on Unbound Wellness. I was getting traction in building my dream, but I needed more time. So, that’s what I did. I got more time. Rather than going all in on Unbound Wellness, I opted for the method of scaling back my roles, freelancing, and working part time while I give myself more time to work on my dream. Like I said, I’m quite good at side hustling and I really, really enjoy it. It allows me to stay in the digital marketing in ministry space which I also really love, and have more time during the week to do Unbound Wellness. Wednesday: 4 hours in an office doing marketing + 4 hours at home doing freelance digital marketing. Now, I’m on day 4 here of this new lifestyle so there’s a lot to be seen as to how this all works out, but I’m hopeful and so excited! If I told you, I’d have to gluten you (which is like being killed in this corner of the internet 😛 ). But really, the sky is the limit! How amazing is it that we live in a world where we can take the initiative to make our own dreams happen? If you’re anything like me, you’ve felt that pull to do this too. Here’s my advice to you.. I don’t care if you need to get a certification, if you need to finish school, if you don’t have enough time. I started Unbound Wellness during wedding planning and a full-time job and built it through school and consulting jobs. Start now and you’ll be happy you did! Some bloggers are already making 6 figure salaries a couple of years in. Most aren’t… including me. Some bloggers launch e-books in a month. It took me 6. Whatever it is, count on it probably taking longer than you think it will. One of the best parts of building Unbound Wellness has been the community that supports me and I’m able to support as well. Reach out to others who are doing what you want to be doing and ask how you can support them. Don’t ask if you can “pick their brain”… ask how you can contribute to the cause alongside them. Make friends, make connections, and fearlessly start conversations. Never burn bridges and never think you’re too good for anything or anyone. I’m excited to keep the relationship going with my former FT employer and am still working with consulting clients that I’ve had for years. Handle your transition with grace! 5. The only person who can limit you is yourself. Nothing irks me more than people asking, “So if you have ___ credentials or ____ goals, what can you do with that?”. You know what? Who cares what people say you can or can’t do? Writing e-books and become a nutritional therapist was not a bulleted option on the brochure when I got my digital marketing degree. But it’s what I wanted to do… so I went out and figured out a way to do it. Never let what other people believe about you, what other people have done, or what other people haven’t done limit you for doing what you want to do. The one belief that I’ve held all of my life about being a creative and boss is this… if you want to be the expert, become the expert. Learn what you have to learn, do what you have to do, and create what you have to create. The only limiting factor is what you’re willing to do to become it. So, what I’m really trying to say is that I’m excited, blessed beyond belief, and ready to do all of the work necessary to build my dream. Thank you all for your support, inspiration, and friendship <3 I can’t wait to keep providing more for you!